Commentary: Sometimes, Hasbro can really impress when doing a refresh of an old mold. Tarados Gon is a modified Sora Bulk with a new head, legs, and lower cloth skirt piece. At first glance, you'd probably never be able to tell. As far as I'm concerned, it's basically a new mold-- kudos to Hasbro for finding a shortcut that really worked well. The end result is a clean-looking super-articulated figure with a new head with a lot of personality, which is nice for a rubber mask. It's not a stunning level of detail, but as Jedi go it's on the happy side of good. With dozens of Jedi in the toy line it's difficult to really stand out, but this is certainly a worthwhile addition to any toy box. It's almost a shame you will probably never see one for retail, at $7 or $8 it's great. At $12+ you might not feel it has the value you seek. Collector's Notes: This figure was from a wave that most of the USA expressed difficulty finding-- you won't see it in stores now, barring some freak warehouse find. You will have to pay more than retail for this one. It's not exactly a stunning creation, but it's certainly worth the effort to own one. Particularly if you want a HK-47. Commentary: This Yoda mold was made to make two different colored Yodas in 2009, both were released near enough to one another where it's hard to tell which, if either, was truly "first." This figure is essentially super-articulated (no knees, as the legs are too small) and is about as good as we'll probably ever see for an animated Yoda. Big head, lots of detail, just enough hair... he's great. This version has very dark green skin, while the Wal-Mart exclusive one (which came with a Clone Trooper) was a much lighter green. From the picture, you should be able to see that it's pretty great and as it's arguably the best version out right now... so just go ahead and get one. Yes, even if you have 14 Yodas already. Commentary: Major Matt Mason would be proud of Obi-Wan Kenobi, complete with fancy retro space suit. I was utterly delighted to see this figure, and then I found out it was on the TV show too and I wasn't so sure. (Just kidding.) The notion of a goofy environment-specific outfit is something Hasbro has tended to avoid with Star Wars unless there's a precedent for it, so seeing a release like this helps to make The Clone Wars feel like a line that may actually be sold to kids. You know, in the same way that Breha Organa and Yarna d'al' Gargan look like figures that no kid would want in a million years. Hasbro did a bang-up job with this all-new figure, giving Obi-Wan Kenobi a more true-to-the-show head and an entirely new space suit body which, to date, has not been reused for any other figure. The outfit combines a number of elements you've seen elsewhere with a new body suit. The belt is very similar to that on the McQuarrie Jedi figures, the shoulder armor is similar to his normal white outfit, and his backpack is modeled closely on that of the model used by the Clones and Jango Fett on Geonosis. The sculpt is cartoony, but detailed with lots of folds, creases, and padding giving it a sense of some bulk. 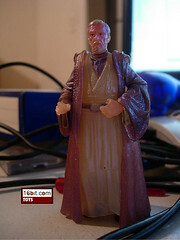 It's also super-articualted, which is something Hasbro hasn't done much for its basic, individually-carded Obi-Wan Kenobi figures frm the TV show. I think this one is great. I was particularly pleased we also got matching Anakin and Ahsoka figures. This is one of my all-time favorites for the cartoon line so far, and I strongly suggest you get one if you're lucky enough to find it. Collector's Notes: While hard to find, the current going rate is at or below retail, so keep that in mind when deciding to buy this one. He came out about a year ago and never became truly "common" in my findings. Image: Adam Pawlus' old desk. I think. Commentary: If there's a short list of things fans ask for in very small numbers that Hasbro, for some reason, does, Bail Organa belongs on it. We got not one, but two figures based on the character's appearances in Revenge of the Sith. This one is based on the ending of the film, where he has no dialogue and does nothing other than hand a baby to some lady they never named through the course of the film. In other words, a fine example of top-notch storytelling. The figure itself has an acceptable face sculpt and decent articulation, although the legs won't be doing much due to his long blue plastic robes. An added cloth robe fits over the figure and is completely removable, which adds a bit of texture to the figure but ultimately this accessory doesn't look very good and makes the figure look cheap. Cloth is tough to do well, as Hasbro continues to illustrate. I would qualify this figure as unremarkable and not essential. 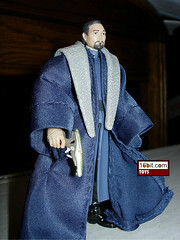 It's not bad-- it's just overwhelmingly average and a second (technically, fourth) ROTS-inspired Bail Organa toy. Do you need more than one? Probably not. He won't disappoint you if you like the photo, but he's not going to delight you, either. Collector's Notes: One of the worse sellers in 2008, this figure may even still be available in some more rural or lower-trafficed stores. $8 felt like a lot, and on eBay he goes for as little as $4 before shipping. I would only advise you jump on this figure if you're in need of his build-a-droid part, or if the price was below $5 as part of a collection or something. Again, he's not awful, just not any fun and rather dull. Variation collectors should take note Bail exists in both a pale skinned (pictured) and a tan version, just like his wife Breha Organa. Commentary: In the comic pack assortments, Hasbro never really clearly defined what they were going for-- sometimes we would see a famous character paired with an obscure one, or in the case of Dark Woman, we see her paired with someone else you've probably never heard of. The Dark Woman has an all-new sculpt, but lacks the kind of super articulation fans started to expect and demand in 2007. With only 8 points of articulation, including ball-jointed arms and swivel forearms, there's not a lot going on here to delight fans of over-constructed heroes and villains. The sculpt is derived from the comic art, but I don't remember specifically where. Her lightsaber is consistent with what I remember, and she always had white hair and looked a little old. But who is she modeled after? Hillary Clinton? Xeni Jardin? Someone's well-endowed aunt? The world may never know, but we can see that the sculpt was nicely done. The face has a lot of personality, the clothing has a lot of creases, and her boots have some nice detailing too. As a bonus, they gave her a little make-up, which helps a lot in the 3 3 /4-inch scale as a lot of sculpting detail is lost at this size. You gotta exaggerate, and having done that Hasbro pulled off a nice figure. Personally, if it meant we'd get more figures for $5 on average, I'd be thrilled to see Hasbro drop the average articulation per figure below 14 points back down to 8 or 10. They're all going to end up on display or in a box anyway, no point wasting money and resources on joints nobody will ever use (with some exceptions, of course.) I personally do not believe this figure would have benefitted from additional articulation. Collector's Notes: While unlikely, you may be able to find this and other black-carded comic packs in your area. Try Kmarts or other places you don't touch with a 10-foot pole, you may be pleasantly surprised. (But the cost is probably closer to modern packs, $13-$15.) On the collector's market, she goes for around $10 before shipping sealed with her companion. 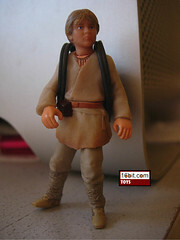 Commentary: Hasbro did three figures (so far) with this Anakin Skywalker mold, each slightly different. This was the first release, and it was notable at the time because he had jointed knees and ankles, a first for the animated-style Anakin Skywalker design. It keeps the same basic head, arms, and body as the previous issue but adds cloth elements for the lower robes and, of course, more joints. If you're going to get only one animated-style Anakin, this one isn't bad. It's easily distinguished from other releases of the mold because he doesn't have a significant scar near his eye-- the others look a little more worse for wear. I'd strongly suggest getting one (or more) of this version to go inside your various vehicles. 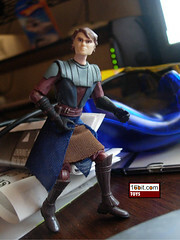 This is clearly the best "pilot" Anakin figure in the first couple of years of the line. Image: Adam Pawlus' guinea pig room. Commentary: More articulation is better, right? 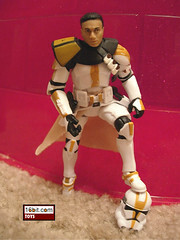 This Clone Trooper takes the now-familiar Star Corps design, as seen on Felucia, and adds a cloth kama as well as ball-jointed hips. Other than that, it's very similar to any of a number of Clone Trooper figures we've bought since 2005. The added range of movement in the crotch is specifically so the figure can sit on a giant grub. It's not bad, but at this point you probably don't need much of an excuse to buy a new Clone Trooper that's similar to ones you already have. The plastic kamas look better, but this one can actually ride a giant bug. The game goes to this version. While neat, one figure and one barely-articulated bug isn't worth the $25 asking price-- it's not a bad set, it's just not $25 worth of toy. At best, it's $18. A second trooper would make it worth the purchase but it's achieving something of a major shelfwarmer status in some markets. I advise you not overpay for one, but retail isn't horrible. Collector's Notes: This set, at press time, isn't selling worth a dang. I would suggest not paying more than $25 for it, ever. It's neat, but not really fun enough to justify premium prices. All the grub does is sit there, and he has an action feature pincher in his mouth. That's it. Commentary: At some point Hasbro decided that you need to own this Darth Vader figure. The body mold has been sold in so many configurations that if you bought all the variations, you would probably have a pretty sizable collection. (More on that below.) With 14 points of articulation, it's pretty good. It's also unique in that the knee joint is a sort of Revoltech-esque ball, the figure's legs are jointed directly below the knee rather than at the heel. This allows for some unique poses and preserves the look of the sculpt. His elbows are cut joints, not ball-joints, which makes it a step back from previously released versions of the character. He does have the cool removable dome which exposes a scarred skull, but lacks the swappable hand as seen in the original mold's release as the 500th Darth Vader. While ubiquitous, the figure is not essential because superior versions were released prior to and after this one, and odds are you can get one of these for next to nothing on one of the many repacks available on the market. It's not a bad figure by any stretch of the imagination, it's just painfully common and Hasbro has one-upped it with several subsequent superior releases. Collector's Notes: This mold started life as the 500th Edition Darth Vader in 2005. 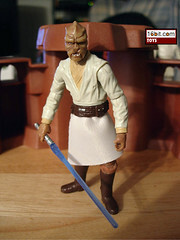 This release came next, which was reaccessorized as a Bespin Confession figure. 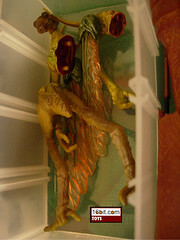 The body was used in comic packs, Saga Legends, Battle Packs, and elsewhere. Also, this specific release came with a bonus holographic figure-- six different blue ones. I've been tempted to get every last flavor of this mold, but so far, have not done so because while obsessive I gotta stop somewhere. I did get all 6 blue holo variants, plus I kept a loose one on my desk since his release in 2006 until I moved my office in 2010. So I guess I can't dump on it too much, it's a nice one to keep around because it really does look nice. Commentary: After a nearly seven year hiatus, Hasbro did another Jar Jar Binks figure in the animated style which some of us have embraced and others still don't like. The figure was around for one assortment and quickly went away, which makes sense given that it's not particularly thrilling as toys go. It is a nice figure though-- 12 points of articulation, a good sculpt, and a lot of personality were worked into this one. Unlike the 2002 version which we just looked at, this one seems to have been designed by someone who actually understands the nature of the bumbling character with his lanky body and slightly awkward mannerisms. 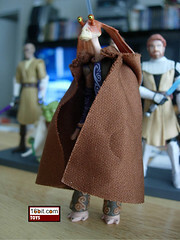 The "borrowed" Jedi cloak is a nice touch too, so he can be a bombad Jedi or whatever. No weapons were included-- which is reasonable, given he doesn't have a signature weapon-- but this does take a little "action" out of the figure. It's odd to think that a figure from the kid-driven line seems to be designed with collectors in mind, but it honestly felt to me that this is what Hasbro did on this one. The cloak has a wire in the neck, so it can cling to him just fine. Hasbro did a great job here, even adding that scarf thing and a little purple to give him an added sense of old-school importance. (Purple was once a color of royalty, you see. Ask your Egyptian history buff buddies.) The figure is a couple of knee joints away from perfection; as it stands it's just merely a high point in Hasbro's cartoon catalog. Collector's Notes: Due to his being in short supply and limited window of availability... he actually is worth something. People are paying a premium for this one. I have to wonder if Hasbro is doing this on purpose to drive collectibility in this segment. If you can find this one for $10 or less, I'd suggest grabbing him because he is a really nice figure and a great, unique character in the line. Hasbro did a good job here, so it's nice to see something of quality command a slight premium. It was only sold on the blue-and-white packaging to date, and were I a betting man I would not expect to see it in the next several months to a year. Possibly ever. Commentary: After watching the Ironic Punishment Division of Hell as seen on The Simpsons like 17 years ago, Hasbro said "all right fans, why don't you have all the Rebel Pilots IN THE WORLD?" (In 2008.) Shira Brie is one of no fewer than 4 figures to share the same body construction released within about 18 months. Four nearly-identical orange jumpsuited women who really aren't any different except for the heads and helmets. Having done the same thing with other pilot bodies, a tremendous number of pilots hit the market and fan zeal quickly turned to apathy, because nothing else is a Clone Trooper. This is not to say this wasn't an exciting release, nor is it to say it isn't a quality product. The figure has the 14 points of articulation you crave, a removable helmet, a holster, and a great head sculpt which tries to be slightly more realistic than that of the art in the comic series. The sculpt is good, the head sculpt is nice, really my only gripe is that her hair isn't as red as it was in the Marvel comic series. I like the creative license they took with her hair, and the helmet looks fine. If you wanted this Empire Strikes Back-era Rebel pilot turned dark lord as a toy, here she is! 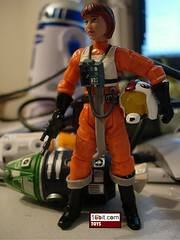 Be glad Hasbro made one, because odds are the glory days of Rebel pilots is now over. Collector's Notes: Upon release, items in this assortment had prices which varied from store to store. They were later sold, without the Wal-Mart stickers, at stores like Ross for about $15. I found mine at Wal-Mart for about $15 when it first hit, so your mileage may vary, but the magic number for the set is about $15. 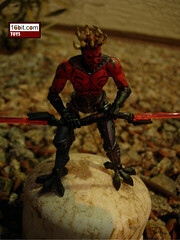 The figure has a great paint job, superior articulation, and a nice distinctive lightsaber sculpt. So while Hasbro did cut corners, it sure doesn't feel like they did here. Nice work. I suggest you get this one if you were a fan of the game, which you may not be, but I am so I dig it. Collector's Notes: At press time it seems the sets are available depending on your market. Some towns have them, some don't-- so you may want to pick these up before they go away, or before the sequel to the game hits at which point I would expect these to evaporate from store shelves quickly. Commentary: While Jar Jar Binks doesn't get a break from fans for his character, and this is expected, one would think that a little more love would be lavished upon his toys. One would be wrong. 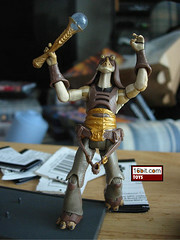 Aside from the animated-style Jar Jar figure in 2009, this 2002 release was the final one. Actually, at press time, Hasbro hasn't made another one in the basic action figure movie-style line, and this one was a real stinker to go out on. Hasbro makes great figures-- and this is not one of them. 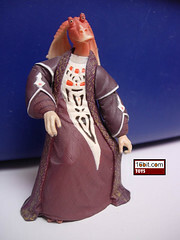 Jar Jar has an awkward pose, not seen on film. He has a weapon, not seen on film. As far as I know this wasn't the result of some excised scene, but rather Hasbro trying to make a character fans hate into something exciting. The end result is something that isn't true to the movie and isn't fun to play with, his big bulky robes prevent him from doing anything but looking awkward. His shoulders, neck, and poseable have articulation you can exploit but all you can have him do is "fight." It's kinda dippy, which is unfortunate because I'd like to have a Jar Jar in this outfit that, you know, just kinda stands around and looks OK. The sculpting and deco of this figure are quite good, but the problem here is that the pose and personality of the toy are all wrong. I can admire them for taking some license with it (and this very figure was on my desk for most of the past 7 years), but it really could have been a little more collector-friendly by not trying to amp up his combat-readiness. Collector's Notes: Got a nickel? You can afford one of these. (Just like I can afford your mom. For a nickel.) But seriously, you can get one of these for next to nothing. As such, don't pay retail, get it in a lot or better still, get it from someone dumping their stash. As of today Hasbro has not confirmed a new Jar Jar based on any of the movies, and if you want the character in this costume it's literally your only choice. Commentary: While not a 100% new figure, it's new enough that Hasbro gets credit. 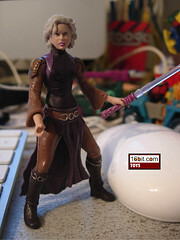 Jaina Solo recycles some parts from the 2008 Stass Allie, but let's face it, arms and legs aren't all that distinctive. The new head and body (and new deco) make her look pretty gosh darned new, and her scarf thing-- which isn't a removable accessory-- makes her look quite distinctive as Jedi action figures go. 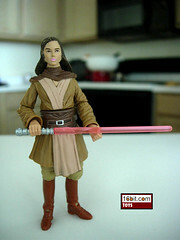 As always (as of late), she has 14 points of articulation and can do pretty much anything you would want a Jedi to do. Her hands (and head) are brown plastic, painted with the flesh parts, which seems to add a little more weight to her appearance. Painted plastic tends to look nicer than raw plastic, as it brings out a little more detail in the face. Her lightsaber doesn't match the on-pack illustration, in color or in the hilt's design. Heck, her outfit doesn't match, either, but the one thing I did notice was that the blade color should be a little more purple than red. She has been seen in this outfit, though, and I have to say I'm happy they didn't just make her a pilot and reuse that body again. Like most Expanded Universe figures, I'd put her at "Why not?" After nearly 20 years, she finally got a toy-- so you may as well buy it because there probably won't be a second. Collector's Notes: While reasonably uncommon, this shared exclusive is, as all toys, available online somewhere. When buying this figure-- especially loose samples-- take care to look at the condition of the face and hands. If the figure received any wear, it's probably going to show some paint rubbing off on these spots, so be sure to keep an eye on them. Commentary: Second verse, basically same as the first. This Galactic Marine is, at face value, the same as the early 2007 individually carded one but with a new gun. This is wrong-- the figure is still the same 14-points-of-articualtion mold that has a hard time standing up due to the weird boot shape, but the coloring is actually quite different. 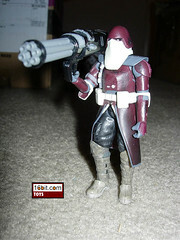 The maroon armor is a lot darker, the dirt pattern has been changed, and the figure's head is much paler than the first edition. There are subtle changes elsewhere, too, but the key point is that this is a very different looking figure when you put them side-by-side. Aside from the pale head, I think I prefer the added detail on this version. The new gun is cool, but it's been packed with other figures-- so I wouldn't consider it a selling point so much as a nice bonus. 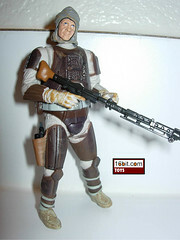 Collector's Notes: Released shortly after Thanksgiving 2007, this was the more popular of the two Battlefront sets. The line proved popular enough for Hasbro to reissue them in 2008 in white-and-blue packaging as a Toys "R" Us exclusive, and this seems to have killed the market on it-- both packs can be had for under original retail on eBay now. For fans keeping track, this mold has been released Galactic Marine (2007), this version, an all-white Galactic Marine for Wal-Mart, a purple repaint for Target, and in a Battle Pack with minimal changes. Image: Adam Pawlus' tackle box. Commentary: Neat idea, iffy execution. This Geonosian Warrior is based on a preproduction drawing, which is why he has no clothes. He also has a hard time keeping together, which is unfortunate for a figure whose sole purpose is to be slashed to bits and reassembled. With very little articulation and an iffy action feature, well, this is a "collectors-only" kind of thing, which is unfortunate given that it was clearly created with kids in mind. 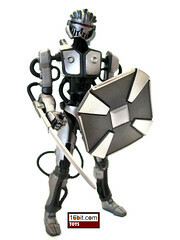 I'm all for a figure that's fun to play with, but I found this one to be annoying and hard to handle. The sculpt is OK, but since it's not based on the final film, well, why bother? You can safely skip this set, unless you really need every last variation on Anakin or the Geonosian Warrior. Hasbro made so many better ones that this isn't necessarily worth your time. Collector's Notes: While the Anakin figure has made a few return appearances, the Geonosian has not. Commentary: At one point this "Masters of the Dark Side" set, containing then-new sculpts of Darth Maul and Darth Vader, was a real rarity. I never once saw one in the wilds of retail, which, to me, means that it's hard to find. Today it doesn't go for a lot, and the figures have since been put into other packs. The real reason to buy the set is the display base, but the figures are quite nice. 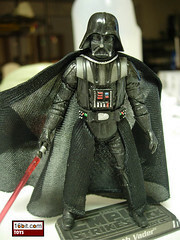 Darth Vader has a cloth cape on his shoulders and a plastic robe around his waist, plus fairly limited articulation in the arms. As a display piece, he looks great as he has excellent sculpting designed to mimic the armor as seen in the original Star Wars film-- note the unique gloves and the robes on top of his shoulders. He won't be good as a pilot, but as a diorama filler or as a display piece this is a great set. Collector's Notes: The going rate seems to be close to original retail. 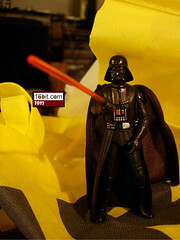 This Vader figure also shipped in other configurations, including as a carded figure and in the Death Star Briefing set. If you just want the Vader, all versions are virtually identical and should be able to be had fairly cheaply. Commentary: During Episode I it seems Hasbro decided that you were going to get an Anakin Skywalker figure if you wanted one or not. The kid-- in pretty much the same outfit-- had numerous releases, all of which were pretty tough to tell apart. He had two carded releases. He was packed with vehicles and games. He came in two Cinema Scenes. Truly, if you were going to collect this line, you were going to get the pint-sized Darth Vader because Hasbro was intent on cramming one down your throat. This release is one of the better ones in the sense that it isn't awful. His action pose, backpack, and deco are on the happy side of good, and his face paint generally was clean without a too-waxy plastic used for his face. Sure, they could make him a little livelier, but since the New Sculpt Train ended for the character in 2000 that seems decreasingly likely. Collector's Notes: If you have at least one young Anakin figure, you pretty much have them all. There's nothing wrong with this release, but they're so samey that only the collector wanting truly everything should pay him any mind. If you're this person, get one. Also, the scene he comes with also includes one of Hasbro's best Darth Maul figures of all time in addition to a great example of Hasbro's work with a poncho Qui-Gon Jinn. You should get the set-- but don't expect much out of Anakin, he's the weak link in the box. Bio: The vintage line does not have character-specific bios. It just reminds you that these are very old figures. In the case of Dengar, you get a summary that tells you nothing of the character along with a photo and a caption saying the original Dengar card front was used from 1980-1982. I know, shocking. Commentary: Each version of Dengar has offered something different, with this one adding the most to the design. This one brings more accessories, super-articulation, and what can be best deemed a hyper-realistic head sculpt to the table. While very realistic, there's a black outline around Dengar's face due to how the head was made which makes him seem less like a toy and more like an Adam Hughes painting in three dimensions. This isn't a knock against it, I like this illusion and I think it brings a lot of personality to a figure that, in all honesty, is yet another version of something you weren't asking for in the first place. The single oddest element of this figure is a removable codpiece. That's right, the armor around his crotch comes off and allows for the legs to be posed so he can sit properly-- a very unusual move. So Hasbro did something that makes it more appealing to both kids and collectors, until, of course, you lose the codpiece and then are screwed. It's a little loose, but a careful collector should be able to keep it on without too much trouble. The armor is basically spot-on to the designs you're used to seeing, There's even a holster, which, while slightly different than that of the movie, works great. It even has a little pistol in there, which is a nice added (and unexpected) detail. Hasbro's expert sculptors really did a bang-up job on this one, and the added articulation allows him to assume numerous poses. This is particularly notable because the previous 1997 and 2004 (and of course 1980) versions were rather stiff and limited in how they could be presented. Dengar can hold the rifle with both hands, or aim it, or just hang out and look cool. I even got some great poses out of him using the new Hasbro "battle game" stands, which, I might add, they should sell by the bucket. When first presented with the notion of Yet Another Dengar, I have to admit, I was skeptical. But this figure is great, Hasbro actually nailed him and now I assume this will be the last new sculpt of the figure. It's just that great. If you have any interest in Dengar, go get this one. Your previous versions will probably never be touched again. Collector's Notes: As a new figure we don't know what to expect from Dengar yet. He's a good upgrade of the previous figure, so it should be popular for a while. It wouldn't stun me to see him hanging around unless Hasbro is deliberately shorting the market, even though he's superb odds are kids will not be interested. Vintage Notes: The early line looks pretty strong. Dengar is good, Bespin Luke is good, most of the figures are on par with or superior to most previously released lines. There are some weak spots. 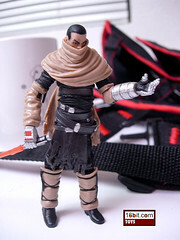 Darth Vader, for example, is identical to the 2010 Saga Legends figure which sells for at least $1 cheaper and includes more gear. The cards from a sealed case come punched, so don't go looking for unpunched variants just yet. There's a tiny order form inside for mail-in Boba Fett, which accepts literally every basic carded figure's UPC since August 2008. Nice. It isn't free, though, it's actually $6.99 + UPCs. 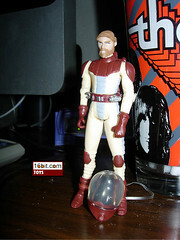 Commentary: Since 1997, Hasbro has tried a few versions of Spirit Obi-Wan. The mail-in one was a nice idea, and it was tweaked slightly for the "Jedi Spirits" Cinema Scene as Power of the Force dwindled. For my money, though, there has been no better release than the 2004 edition-- which is this one. 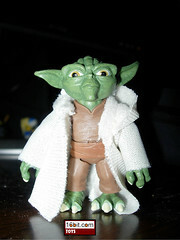 The robe is a little darker than the later "Jedi Training on Dagobah" release, and even though it includes a lightsaber-- presumably due to fan outcry that the previous versions didn't have one-- it's still pretty authentic. The outfit is about right, and it's a mix of new parts plus bits and pieces from a figure released in 2000, but tweaked just a little bit. The likeness is pretty great, and the pearlescent shine to it also works quite well. Articulation is, for the time, pretty good. All meaningful articulation below the waist is crippled by the robes, but shoulders, wrists, and swivel elbows do allow a little bit of movement upstairs. You won't find a better Spirit Obi-Wan yet, so if you can find this one (or one based on this one's release), do so. Collector's Notes: I consider Wave 1 of The Original Trilogy Collection (Dagobah Obi-Wan, Luke, R2-D2, and Yoda) a required purchase for all Star Wars fans. It's also practically worthless-- but the four figures are loads of fun and can join together to make a nice diorama. Not buying these means that you are part of the problem in this hobby, so get them if you can.